I am a big fan of bicycles as a greener transportation alternative and would love to see my city become more bike-friendly. Just this past weekend, we rode to a friend's house for an early Thanksgiving dinner party with our food containers strapped down, so we wouldn't have to drive a car a very short distance. I liked to call it Meals on Wheels. And in honor of tonight's monthly Critical Mass ride, today's Link Friday is all about bikes and related eco-friendly products. Recycled Cycles of Acadiana. A local bicycle shop that sells bikes and accessories, included restored used bikes. They also rent bicycles, if you need one for a short period of time, which is wonderfully eco-friendly. Blackburn Design. Front and rear lights are a very important part of any bicycle, and there are varying degrees to how green they can be. LED lights are very popular and easy to find at any store, since they are extremely bright and energy-efficient. Blackburn's lights seem to go one step further, being LED and rechargeable. The lights can be charged through any USB device, saving you from needing to replace any batteries at all. They've also got some solar-powered lights. However, a quick Google search for LED bicycle lights will find you tons of options. Alchemy Goods. Alchemy Goods uses discarded bike tubes to make bags and wallets. They've got partnerships with Trek, REI and independent bike shops across the country in order to get their stock of materials. I've got one of the mini-wallets and I love it! Earth 911. There's an article from this week about someone who used campaign signs to make bike accessories. I'm personally loving the yellow basket made from corrugated plastic signs, since I'm still brainstorming ways to make a new and better bike basket. Re-Cycled Accessories. Jewelry and accessories made from bike parts. 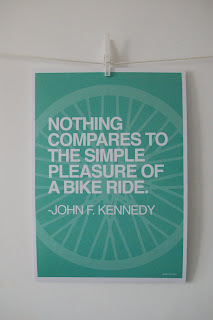 Have a wonderful weekend, and if you have a bike, get out and ride it!